“Fitness” and “getting healthy” can be intimidating goals to set, especially if you’re starting your fitness journey at square one. Everyone has personal “fitness goals”, but they’re usually too-far-off destinations that we can never seem to reach. In the past year, I’ve made a healthy lifestyle a priority and I’ve challenged myself to work out more and become conscious of what I’m putting in my body. Healthy living doesn’t have to be scary, and it shouldn’t be! Here are some super easy tips that anyone can do, no matter their current lifestyle or activity level. Love yourself where you’re at. Start by working out one (extra) day a week. If you want to start working out, but don’t right now, then start out with just one day this week! It’s basic science, (Newton’s first law, actually ), an object at rest will stay at rest, and an object in motion will stay in motion. Once you start working out, it’ll be easier to keep going. If one day still seems scary, try working out for just 5 minutes. I promise, after those first 5 minutes, you’ll be ready to do 5 more. If you do have a workout routine, but want to step it up, try working out one additional day each week, or try extending your current workouts by 10-15 minutes! Try a fitness app, or a fitness tracker. I got a Fitbit Flex this August, and since then, it’s motivated me to try and get my daily 10,000 steps and meet other weekly goals. iPhones have a health app built in, and already count your steps in the background. The free MyFitnessPal app is great for logging food, weight, and workouts. MyFitnessPal even pairs with the Fitbit app to share your data and accurately count your daily calories. Fitness tracking is an easy way to monitor your activity and keep up with your goals. Bonus tip: the Achievement app is free and will pay you for logging your steps, exercise, weight, and food! I just started using this app, but it’s worth checking out. If you’re already logging your fitness data, you might as well get paid for it. Give yourself a “don’t eat after…” time, and stick to it. Depending what time you usually go to sleep (or if not, a regular sleep pattern is also super important), set a time 30-60 minutes before bed that you won’t eat after. This helps cut excess late night snacking and means you won’t have food to fully digest after your body has slowed down when you sleep. There are mixed studies on the benefits of this, but it is a good way to help curb extra snacking if you’re prone to super-late snacks like I am. Make one healthier choice every day. Along the lines of #2, this is a simple way to get yourself on the road to a healthy lifestyle. Make one daily choice for something that’s better for you. Whether it’s choosing to go to bed an hour earlier, choosing to snack on an apple instead of a cookie, or choosing to take the stairs, there’s endless little things that really do add up. Make a motivating workout playlist, or find one. Not of “goal” bodies, which only make me feel worse about myself, but fill a board with easy recipes and workouts that are plausible for you to use. I have a board with easy, healthy snacks and some circuits that I can easily do by myself, at home or at the gym. Get a workout buddy, or two! Accountability is so important for any area of your life you want to improve. I have my friends and family on Fitbit, so I can see their progress throughout the week, and it does get competitive. Find a few friends who want to get fit too, and workout or eat healthier together. Then, you can hold each other accountable to sticking to it, and you can push each other during your workouts. 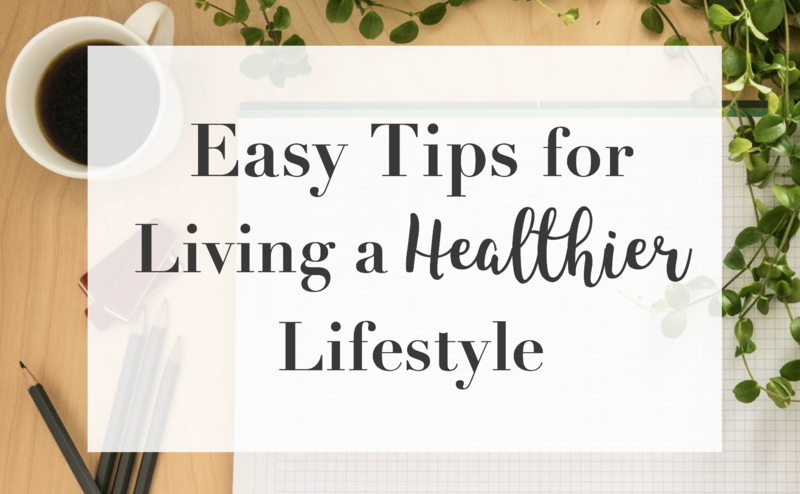 If living a healthy lifestyle is one of your goals this year, I hope you try out some of these tips and find what works best for you! These are just a few of the many things I’ve learned this year along my own fitness journey, and I hope you’ll find them as helpful and easy as I have! That sounds like a great plan! Love getting to see your progress in Fitbit too 🙂 love you!